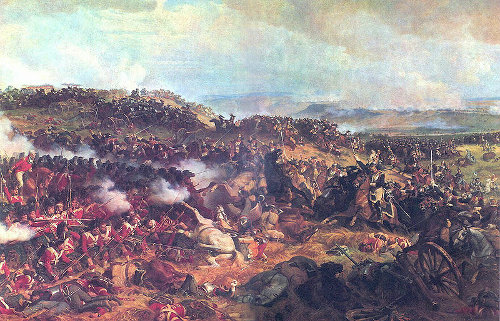 The Battle of Waterloo on June 18th 1815 was the climax to over 20 years of wars that had devastated Europe. It was the moment Napoleon was finally defeated and is seen by many as the birth of modern Europe. In my other article on the Battle of Quatre Bras I go into more detail on the origins of this battle. In brief on returning from exile on Elba, Napoloeon had gathered an army of veterans and marched on the combined Anglo Dutch under Wellington and Prussians under Blucher. The allies were positioned in Belgium waiting to attack France. Napoleon did not dance to their tune but attacked them first and drove into the gap between the two allies. On 16th June, at the cross roads of Quatre Bras, the French under Marshall Ney and Anglo Dutch under Wellington were locked into a stalemate battle – neither side being able to send aid to the main battlefield of the day – Ligny. At Ligny Napoleon battered the Prussians and forced them to retreat BUT because Ney had not broken through at Quatres Bras had not had enough troops to crush Blucher. 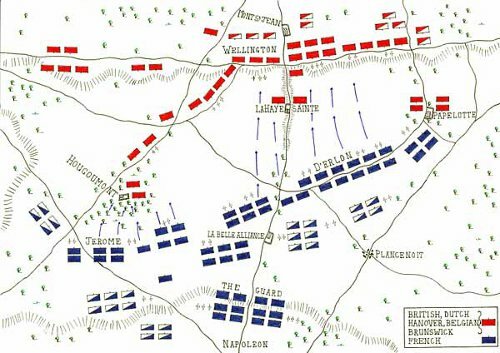 On the 17th June Wellington was forced to fall back to the position at Waterloo whilst waiting and hoping that the Prussians would also retreat northwards – keeping in contact and able to aid the British. Blucher did this and as dusk fell on the 17th the scene was set for the battle of Waterloo. Napoleon was conscious that Blucher might try and rejoin Wellington and send a third of his army under Grouchy to pursue the Prussians with strict instructions NOT to allow that to happen. Blucher left just 1 corps (a quarter of his force) to hold the French at Wavre whilst the other three set off at once towards Waterloo. Their arrival would be critical as we shall see. Hearing that Blucher was marching from the village of Wavre (where the Prussians had reached the night before) Wellington deployed his army on the northern side of a valley near a small Belgium village of Mount St Jean just south of the town of Waterloo. Wellington was a genius at the defensive battle and had seen that this location was perfect. The ridge itself would hide his men and forward of the slope there were three strongholds. On the his right wing the fortress of Hougoumont. Here he deployed some of his guards companies. Covered by woods to the south (in which he placed light infantry) the Chateaux had tall stone walls and thick gates. In the centre of the position was the fortified farmhouse of La Haye Sainte. To the left were several connected buildings at Papelotte and La Haye. 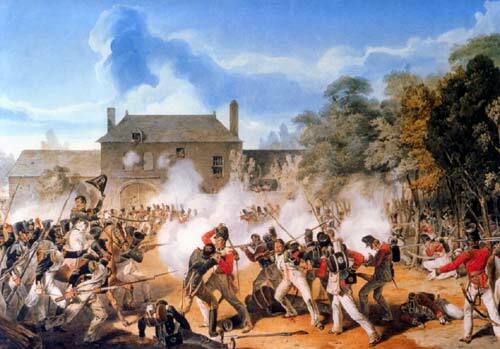 Napoleon opened his attacks by sending Reille’s II Corps to assault Hougoumont hoping to draw the British away from their left wing where he had prepared a hammer blow. Intended as a diversion, more and more French forces were drawn into the battle around the fortress which caught fire but never fell. Napoleon now sent forward the 16,000 infantry of D’Erlon’s I Corps to try and smash through Wellington’s left wing. The French attacked in dense columns and the sight must have been terrifying. But the British had seen this before many a time in Spain and calmly stood up in line, levelled muskets and blasted the French Regiments. With the French regiments in disarray Wellington committed his heavy cavalry under Uxbridge. Thought to be the finest mounted cavalry in Europe the Heavy cavalry of the Scots Greys and other regiments thundered through the gaps in British regiments and shattered the French. D’Erlon’s men ran and the horses pursued. BUT they now made the mistake British cavalry always did: they went too far. With cries of ‘Tally-Ho’ – as if they were hunting fox in Leicestershire they found themselves winded and far away from the British lines when the French lancers caught them and destroyed them. Around 4pm the British, having repelled the French attack reorganised their lines and pulled back over the ridge. Napoleon was at this moment ill (he had a stomach ulcer) and Ney who was in charge saw this movement and thought Wellington was retreating. He ordered the entire French Cavalry reserve to attack at once. The charge by the French cavalry at Waterloo would have look terrifying and magnificent at the same time. Initially 5000 horses charged bt when they crested the ridge they found the British were NOT retreating but had formed square 0f the defence against cavalry. Scattered like a chess board these squares resisted no less than 12 French charges with as many at 9000 Cavalry at once. The British endured and held on. The Prussian’s finally started to arrive from about 4pm onwards. Napoleon sent his Guard and a reserve Corps to hold them back. To begin with they defended easily but more and more Prussians arrived and gradually the French fell back into Plancenoit. That town fell and the French used the Young Guard to assault it and recapture it. Things were getting desparate though. Napoleon knew He HAD to break Wellington NOW or lose the battle. 7pm The Guard Attack – final thrown of the dice. Napoleon gathered all his resources. he threw forward a heavy attack to take La Haye Sainte. Then vast clouds of skirmishers supported by artillery and cavalry pounded and pulverised the Anglo-Dutch lines who could do little save stand and suffer. Wellington, trusting that the Prussians would fill the holeÂ abandonedÂ Papelotte and concentrated all his men in the centre of the line, he held on and endured. Now was the time for the thunder strike. 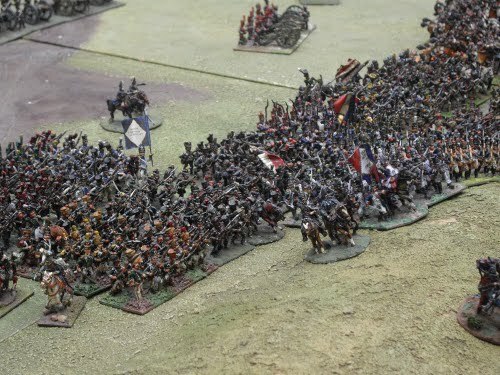 Napoleon sent forward his Imperial Guard. Veterans of many battles ato assault the British between La Haye Sainte and Hougoumont. These were the men who had conquered Europe and he needed them to do it one more time. They stomped up the ridge towards the British. But what was this? the ridge seemed empty. All they could see was a few officers. Â Was that Wellington up there on his own. One authority had him adding Up Guards, ready. As one the British Guard’s Regiment under Maitland rose from where they were kneeling in the grass. They levelled their muskets and fired. The best marksmen in the world now fired devastating volley after volley. The Imperial guard – never before defeated – wavered, fell back and RAN. The Anglo Dutch and Prussians surged forward and the French routed and that was that. Within an area of 2 miles by 2 miles there were 48,000 bodies – killed and wounded – desperately crying for aid. It was Wellington’s last battle. It was a bloody and costly battle but finally Napoleon was defeated.